WASHINGTON, DC, June 21, 2013 (ENS) – Better biodiesel, better household cleaners, building materials made with a 3D printer – these are a few of the innovations that have received this year’s People, Prosperity and the Planet Award for their solutions to some tough public health and environmental challenges, the U.S. Environmental Protection Agency announced Wednesday. Each of the seven award-winning teams qualifies to receive a grant of up to $90,000 to further develop their design and potentially bring it to the marketplace. “This competition plays an important role in inspiring the next generation of scientists and engineers to better understand, and through innovation and ingenuity more effectively solve, our world’s complex environmental problems,” said Lek Kadeli, principal deputy administrator for the EPA’s Office of Research and Development. Previous P3 award winners have started successful businesses and are globally marketing their technologies. Loyola University of Chicago for developing a greener way to treat and reuse byproducts of biodiesel production. The current biodiesel process creates salts, oils and methanol as waste products. The team is designing a combination distillation and wetlands system to treat and reuse the contaminants onsite, making biodiesel production fully sustainable. University of Massachusetts Lowell for creating nontoxic, biodegradable surfactants from fruit peels and algae. Most surfactants are petroleum based compounds used in everyday products such as household detergents, personal care products, and industrial cleaners. The majority are either non-biodegradable or break down into toxic products. This team is synthesizing greener surfactants from fruit peels and algae and analyzing their effectiveness. Radford University for designing a naturally-occurring coating that would allow sand to absorb water pollutants, such as arsenic, cadmium and lead. The design is based on humic acid, a naturally occurring compound that chemically grabs water pollutants. The team is designing a synthetic humic acid made from sugars that could be more economical and effective than current processes. 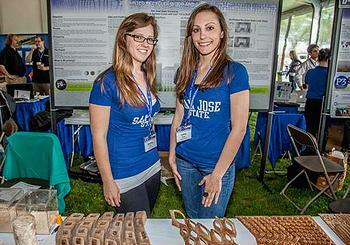 San Jose State University for using sawdust instead of plastic to create inexpensive building materials, customized for local climates, with 3D printer technology. The team is making inexpensive window coverings such as shades and shutters that can be tailored easily to local climates. Georgia Southern University for further innovating the low temperature combustion diesel engine, to operate on locally sourced n-buthanol and cottonseed oil; thus designing a diesel engine that could create lower NOx and soot emissions. Cornell University for designing a simple, low-cost, lower-maintenance water filtration device for Honduras communities, using a stacked-rapid sand filter. The AguaClara stacked rapid sand filter is an efficient, inexpensive, and fully hydraulic unit process for municipal-scale water treatment. It is expected to be a sustainable alternative, especially for communities in the developing world where conventional water treatment technology has often failed. Cornell University for evaluating and improving cookstove fuel resources in Kenyan communities by burning solid fuel without oxygen, which can create biochar for soil enrichment. This year’s competition featured some 300 student innovators showcasing their sustainable projects designed to protect people’s health, the environment, encourage economic growth, and use natural resources more efficiently. 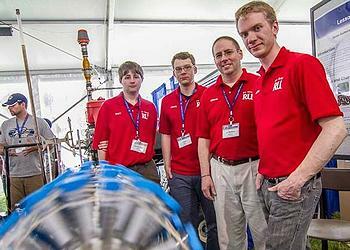 A panel of expert judges convened by the American Association for the Advancement of Science recommended the winners out of 45 teams following two days of judging. The teams that competed this year proposed potential solutions to worldwide environmental problems, particularly in developing countries. Every year, the National Sustainable Design Expo features EPA’s P3 competition and also highlights other sustainable initiatives, programs, and technologies developed and implemented by nonprofit organizations, government, and state agencies. This year’s expo was co-sponsored by the American Society of Civil Engineers and Engineers without Borders, USA.